A collection of new paintings by Luke Cornish inspired by his travels to refugee camps of Lebanon. Surrounded by the sound of gunfire, Luke draws on his artistic skills to bear witness to the suffering, hope, violence and everydayness of the displacement and conflicts. Luke Cornish is an Australian artist creating unique, powerful images from handmade stencils. His rise within the contemporary art world has been meteoric, becoming the first artist to be nominated for the Archibald Prize and the Sulman prize with a portrait created entirely out of stencils. A former blue-collar worker from Canberra, Cornish's apathy and boredom during his mid-twenties encouraged him to start experimenting with stanley knives and spraypaint cans. Nearly ten years later, Cornish has literally carved his name into the public's mind. Using up to 85 layers of carefully hand-cut acetate, he sprays layer upon layer of aerosol paint until his images bear a striking photographic resemblance: this is a new form of hyper-realism that is unlike what has been seen before. Formally known as E.L.K, he uses the tools of a street artist to create decadent, detailed works that envelop the viewer. There is an honesty to Cornish's work, slicing back the layers and reconstructing his muses with astonishing deftness. The emotions that permeate through the eyes of his portraits have great depth, the shadows created by the stencils highlighting their anguish. His subjects all seem to share the same hardship and determination that Cornish himself has experienced, lending to a sense of dire reality in the unreality of his images. 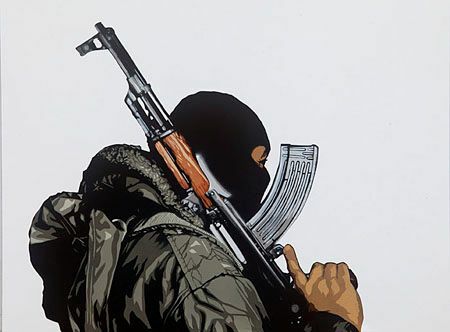 With this new exhibition Luke presents us with works that act as a looking glass through which we can see the darkest elements of crumbling societies - where we could be if not for the accident of our birth. We see the collapse, conflict and displacement of once vibrant worlds. But again, as Luke finds in the bleakest corners of the world, he finds reasons to celebrate the resilience of communities and the continued sense of hope despite the surrounding despair. This new body of work is one of difference and disparity. We are presented with the multiple dimensions that capture the mixed emotions and juxtaposition of zones of conflict. His layers of stencils and paint capture and reflect the layers of complexity and emotion he attempts to capture. His figures 'float' in a white background making them feel simultaneously distant and approximate.Surprisingly, this aids our ability to witness the lives portrayed by Luke through his unique looking glass. Once again, Luke's work crosses the boundaries, taking us from 'street art' to the gallery. More importantly, however, is the boundary that he forces us to confront - from looking away to witnessing the horrors of war and displacement.